First a little bit of background on Mr. Gritzbaugh. He is an 8-year Army veteran who has been with Gerber for the past 4 years, 3 on the Tactical Marketing team, and the past year as Marketing Communications Manager. He has been a lifelong outdoorsman who does seem to know knives. If I had to formulate a judgement based on our correspondence and 20 minute phone call, I would say that Andrew “gets it”. Whether or not he is surrounded by people both above and below him that share in this is something I cannot yet say. But as they say, the first step on the road to recovery is admitting that you have a problem. And I was shocked with how Andrew opened the interview. “You are not wrong“, is how he started. He went on to explain that Gerber is well aware of the perception that I said “is metastasizing” in the knife world, and does have a grand plan to right the ship. In fact, he claims that a plan has been underway for a couple of years now and he has personally noticed a clear directional shift in the company. Of course, Andrew is a PR guy, and some of his answers were kind of flacky. None more so than his response to the recall situation. 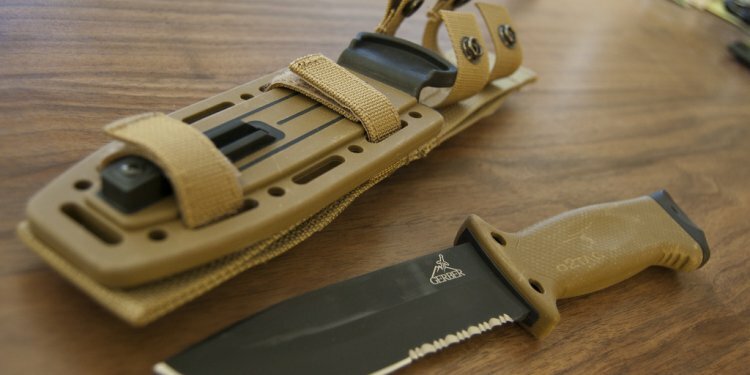 In fairness, several of the recalls are on sheaths with stitching and other minor issues, but several are on knives themselves including the Bear Grylls parang which has a tendency to snap off at the neck, or the failure of the locking mechanisms on the Cohort and Instant. When asked, Andrew says that QC is important to Gerber, and when you have production runs the size that Gerber does, the small percentages get larger in absolute terms, so while a dozen failures might trigger action for Gerber, similar percentages of failure might go unnoticed in the normal course of warranty transactions in a smaller company. Where is Gerber Knives made?